When you hear the phrase “primary source,” do you imagine dusty archives and special collections shelves? 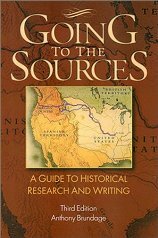 In fact, primary sources are available in all types of collections and formats. Widespread digitization projects have made access to primary sources easier in more than one way: Not only are many primary sources accessible anytime and anywhere on the Web or through the library online collections, but their content can now be viewed much faster through simple keyword searches. In the past, a scholar had to spend many hours sifting through page after page of a single source. Today, you can quickly search and find key words of interest in the text of multiple sources with comparatively little effort. Falvey has a wide variety of primary sources in its digital collections and outstanding print collections. Find out more from the History & Sociology blog.